This package includes newsprint to make 4 samples. Instructions are included in the April 2019 issue of American Patchwork and Quilting. 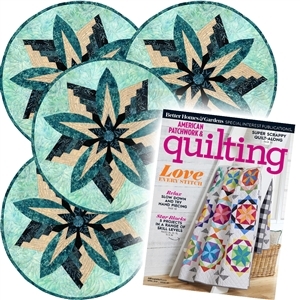 You can purchase this on newsstands through early April 2019, order from Quiltworx.com (while supplies last), or purchase an online version of this issue from the Archives at the American Patchwork and Quilting Website. Used with permission from American Patchwork & Quilting®. ©2019 Meredith Corporation. All rights reserved.